How could you make a motor spin in different directions? With an H-Bridge! 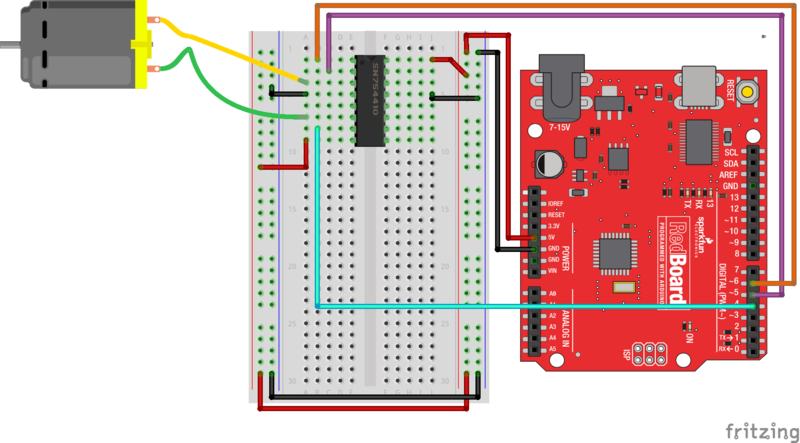 In this experiment you will use the H-Bridge to control the motor's direction and speed. The SN754410 is an Integrated Circuit (IC), called an H-Bridge, that makes controlling motors easier. An H-Bridge allows you to control both the direction and the amount of an electrical current being supplied to a motor. You can think of it as a smart valve that allows you to change the direction of the current passing through the motor. 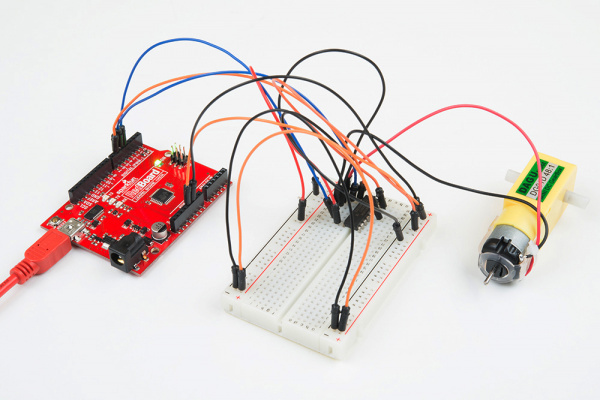 To switch the direction of the current, you use two pins to toggle pins on the board either HIGH or LOW. If the two direction pins are both HIGH or LOW at the same time, that causes the board to brake the motors. If one pin is HIGH and the other is LOW, the motor spins in one direction. If you flip-flop the states, the motor spins in the opposite direction. 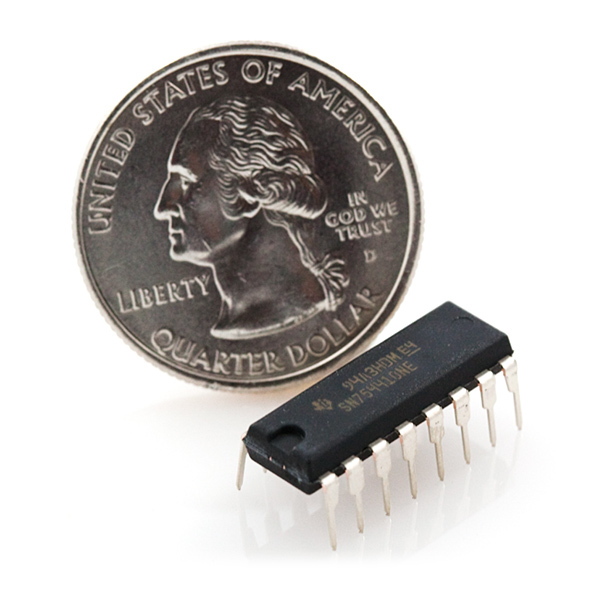 The IC is also powered separately with 5V supplied to pin 16 on the IC, and up to 36V for the motor voltage on pin 8 of the IC. WARNING: You will be using voltage that may be higher than the limit of the circuitry on your RedBoard allows! Make sure you keep motor voltage (MV) isolated from other circuitry! Accidentally using MV to power other circuitry may cause irreparable damage to your RedBoard! You can control up to two motors with a single IC. You can use this diagram as a reference for pin numbers in conjunction with the table below. Note: It is possible that you may need to bend the legs of your H-Bridge in slightly for it to line up with the breadboard. You can do this by using a table top as a flat surface and gently "roll" the IC using the table to bend the pins until they are vertical. //in a brake situation, but set as 0. The Motor Driver uses a control logic that works by pulling certain pins HIGH or LOW (pins 4 and 5 in this case) to change the direction of the motor's rotation and then send a PWM signal to pin 6 to control the speed. This chunk of code runs to motor in one direction at full speed. This chunk of code is similar, but changes the direction by flipping the direction pin's state and setting the PWM pin at a slower speed. This final chunk of code demonstrates the logic for stopping or "braking" the motor by pulling both direction pins to the same state. In this case we used LOW, but both set to HIGH would produce the same results. In a brake, the PWM level doesn't matter. We set it to 0 as more of a formality than anything. If not, see the Troubleshooting section below. You should see the motor spin in one direction at full speed for one second, then brake (stop) for one second, and run at a slower speed for a second in the opposite direction and and then repeat. Make sure that you have the enable pin as well as the logic and PWM pins wired correctly. It's easy to make a wiring error, as the names of the pins of the board are on the bottom. Double check your code. You may not have inverted the logic pin's state to reverse the motor.